Over her more than fifty years on the screen and in the public eye, Jane Fonda has worn more hats than any performer of her generation: daughter of Hollywood royalty (Henry Fonda), Oscar-winning actress, polarizing activist, fitness guru, best-selling author, Broadway star, mother, grandmother and wife, to three of their respective generation’s most influential men (director Roger Vadim, activist/politician Tom Hayden, media titan Ted Turner). Now in her 74th year (she turns 75 in December), Jane Fonda graces the screen again in director Bruce Beresford’s “Peace, Love and Misunderstanding,” a generation gap comedy-drama about an uptight career woman (Catherine Keener) who, after leaving her husband, brings her two kids (Elizabeth Olsen and Nat Wolff) to Woodstock, New York where her estranged mother (Fonda), a former and current hippie, lives on a sprawling farm. Truth, reconciliations and laughter soon follow. The IFC Films release, which also stars Jeffrey Dean Morgan, Chace Crawford and Marissa O'Donnell opens June 8. 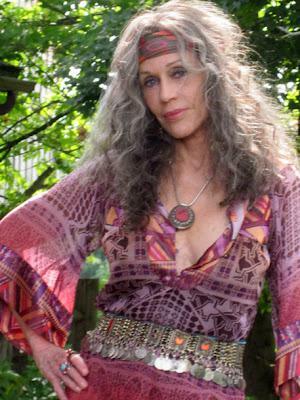 I know you weren’t really a hippie during the sixties, so which part of Grace did you most relate to? Related to that, your circle of friends in the film really idealize the sixties and all they represented. Do you remember that time as being “magical,” so to speak, or were the sixties terribly overrated, as many people also seem to feel? Do you feel that there have been any changes since then that have been quite as seismic? I think the internet, the technological stuff has changed everything. We can see it overseas even more, with the Arab Spring, and so forth. Every decade has its own aspects of change. Then it was drugs, the Pill and a war and now it’s technology and globalization. How important is technology in your own life? It’s very important. But, I never used a computer till I was fifty-eight. I was married to Ted Turner and he threw it across the room. (laughs) He still doesn’t use one. I’ve always been a public speaker, and I would always cut and paste. So my speeches would look like Greek scrolls, held together with Scotch tape. Suddenly somebody showed me cut and paste on a laptop and it changed my life. I never would have been able to write any books without it. Then when I turned seventy-one, I was about to return to Broadway after forty-six years and I met a guy in Atlanta who convinced me to start blogging. And I thought ‘You know something that might be really interesting. From the day I leave Atlanta, I’ll write a daily blog about what it’s like to be back in New York.’ I lived there in the fifties. So how had it changed? How did I feel about it? I started getting feedback, and it was really interesting. Suddenly my life became very immediate. I would blog and get immediate feedback. I’d go on stage and get immediate feedback. So that’s what’s really changed, the immediacy of things. Do you feel that today’s young people are starting to go back to the values of the sixties somewhat, with the Occupy Movement, and the like? Somewhat, yes, but the main difference is there’s no leader. In the sixties, you had all these organizations with leaders, most of them men. I married one, Tom Hayden. There were male leaders of the movement then and now there’s not and people are really getting upset about that, but I think that’s part of what makes it so beautiful. I think those people really are making a difference. That demonstration in Seattle when the World Trade Organization met up there, in many ways that was much more significant than anything that happened in the sixties. People’s need to band together hasn’t gone away, but the existence of Twitter and Facebook and the internet has really changed the face of it. The drugs are different, for better or worse. 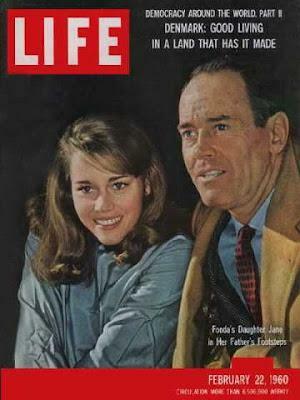 Above, Fonda with father Henry. Below, with son Troy Garity. You mentioned your dad a couple times. The other night I watched “Klute” and “The Grapes of Wrath” back-to-back. I was struck by how you and your dad share so many of the same nuances on-screen. Let me tell you something, my son is an actor. His name is Troy Garity. He went to the American Academy of Dramatic Art and the first play I went to see him in there was a moment where he hesitated and turned, and it was my dad! And Troy was five when my dad died, so where does that come from? It’s absolutely fascinating. I was already a mature actress when dad died, so it makes more sense with me, but where does he get that, do you think? Well, there’s genetics and in your case, stuff you picked up unconsciously from growing up with your father, but consciously what do you feel you learned about acting by watching your dad? (Long pause) Consciously, nothing. I never could get him to talk about acting, ever. I produced “On Golden Pond” for him and after our big scene together, I still couldn’t get him to talk to me about acting. I learned about life from watching his movies, like “The Grapes of Wrath,” “12 Angry Men,” “Young Mr. Lincoln,” it’s what made me who I am, the roles he played. In many ways I learned more from Katharine Hepburn and I’m older now than she was in “On Golden Pond,” which really staggers me because I feel so different than I think she did then. But I am my dad’s daughter and I know I look like him, in many ways so I’m sure that there are things that other people see that I don’t. Another theme this film deals with is how oftentimes children go the opposite direction of their parents in terms of their values. Is that something you’ve seen in other families? Sometimes. I was worried once about my daughter. She is feisty, oh God! (laughs) I was always away when she was growing up, always at meetings. I said ‘You’re probably going to rebel against me and become a Republican.’ She said “I may become a Republican, but don’t think it will have anything to do with you.” (laughs) The theme of forgiveness is one of the most important themes for me. It helped me to write my first book, “My Life So Far,” and I think it’s one of the most important themes in life. I loved the theme of forgiveness and compassion that the movie has. 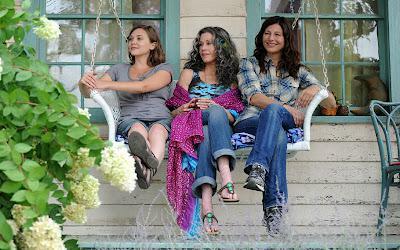 Most of your big scenes take place with Catherine Keener, who plays your daughter. Keener knew going in that I knew very little about hippies, so she brought all this amazing music with her, which I just surrounded myself with. She also brought a bunch of documentaries about Woodstock, which was very important and very helpful. You mentioned earlier that you don’t feel now like you imagine Katharine Hepburn felt at this age. Do you feel like the aging process has changed over the past couple decades? Yes, I think older people, women in particular, have stayed young by remaining physically active and I like to think I have something to do with that, which makes me feel good. 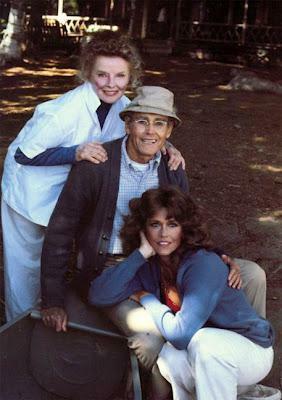 Katharine Hepburn, Henry Fonda and Jane Fonda "On Golden Pond." You’re still absolutely stunning, by the way. If I remember that chapter in the book correctly, the two of you got off to a contentious start on that shoot. I asked Alan J. Pakula when we got to New York if it could be arranged for me to spend time with call girls and with madams and I did. It was eye-opening. I would go with them to meet their johns. I would go with them when there were cutting up their cocaine and when it was over, I went to Alan and said ‘Alan, I can’t do it. I can’t play this character. During the whole process, not one john even looked at me. They didn’t wink, didn’t make a pass, nothing. I’m so not that. I can’t do it. You’ve got to hire Faye Dunaway.’ He just laughed. So then I remembered some of the call girls in Paris, who were $2000 a night, the sort of women that Dominique Strauss-Kahn says “I didn’t know they were prostitutes.” (laughs) They’re very beautiful, very intelligent call girls. I thought ‘Okay, I could do that, be that type of call girl, one could have done any number of other things.’ I studied why women would do that, women who had other skills. I think Bree was sexually-abused and that changes everything. The only thing I changed in the script was all the psychiatrist stuff was improvised and originally in the script, the psychiatrist was a man. And I knew that Bree could never open up to a man. She could come on to him, try to sit on his lap or something. So Alan and I agreed to keep all those scenes to the very end, when I really inhabited Bree, and then I improvised and that was really fun. You’re appearing on Aaron Sorkin’s new show “The Newsroom” this month on HBO. Tell us about that. Well, it’s just perfect television. It’s just absolutely brilliant. I think it’s going to have a huge impact on people, and on the news and maybe on the election. It’s going to be very controversial. And it is just totally amazing. I’m so proud to have a small role in it, just three episodes. I play the woman who is owns the conglomerate that owns the network, it represents less than three percent of my annual profit, but the newsroom can make a lot of trouble for me. I know something about this, after all. (laughs) I drew from some of the personality traits of Ted for the character, because he’s very funny.